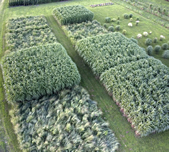 CHAMPAIGN, Ill. - In the largest field trial of its kind in the United States, researchers have determined that the giant perennial grass Miscanthus x giganteus outperforms current biofuels sources - by a lot. Using Miscanthus as a feedstock for ethanol production in the U.S. could significantly reduce the acreage dedicated to biofuels while meeting government biofuels production goals, the researchers report. The new findings, from researchers at the University of Illinois, appear this month in the journal Global Change Biology. Using the grass Miscanthus x giganteus as a feedstock for ethanol production would significantly reduce the amount of farmland needed for biofuels, said U. of I. crop sciences professor Stephen P. Long. In field trials in Illinois, researchers grew Miscanthus x giganteus and switchgrass in adjoining plots. Miscanthus proved to be at least twice as productive as switchgrass. "One of the criticisms of using any biomass as a biofuel source is it has been claimed that plants are not very efficient - about 0.1 percent efficiency of conversion of sunlight into biomass," Long said. "What we show here is on average Miscanthus is in fact about 1 percent efficient, so about 1 percent of sunlight ends up as biomass." Corn, switchgrass and Miscanthus are grown side by side in experimental plots in Urbana, Ill. These fields, shown in 2006, were in their second year of growth. A PDF of the journal article is available online. To reach Stephen P. Long, call 217-333-2487; e-mail: slong@illinois.edu. To view or subscribe to the RSS feed for Science News at Illinois, please go to: http://illinois.edu/lb/rss/608/text.xml.